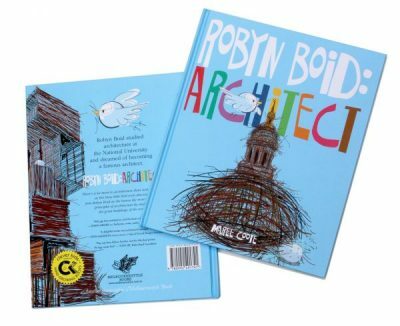 Robyn Boid is a small, dedicated bird who loves to build nests and dreams of becoming an architect. She lives at the University, where she listens to the architecture classes through the window. Eager to learn, Robyn practises building all the important architectural shapes, but all the while she seeks the perfect design for her own nest. Recommended for readers 5 years+. Maree Coote is an award-winning Melbourne based artist, writer, designer and photographer. Her numerous books, including Andy Web – Artist (2016), Spellbound (2015), Alphabet City Zoo (2014), Alphabet City (2013), and The Melbourne Book (now on its 4th edition!) are a visual feast and design dream!